The 2017 “Best Colleges” edition of U.S. News & World Report ranks John Carroll University #6 among universities in the Midwest offering master’s programs. This marks the 29th consecutive year the University has been named one of the top 10 regional institutions. #1 in the nation in student preparedness for employment, according to Bloomberg Businessweek, 2016 survey of employers. We are the only Ohio college or university to be named among the “top 100” MONEY Magazine 2015-16 Best Colleges rankings. Forbes lists John Carroll University as a Top 10 school in Ohio for their America’s Top Colleges 2015 rankings. John Carroll ranks among Kiplinger’s Top 100 Best Values in Private Colleges for 2014. JCU is one of only five Ohio schools in the “private school” category and ranks #92 in the nation. John Carroll University has been named to the President’s Higher Education Community Service Honor Roll for eight consecutive years. In October 2014, for the fifth consecutive year, U.S. News & World Report recognized JCU as one of the top 25 colleges and universities in the nation for service-learning programs. The Boler School of Business holds dual accreditation by The Association to Advance Collegiate Schools of Business (AACSB), a distinction held by only 5% of business programs worldwide. In his letter dated September 22, 2016, Fr. Brian Paulson, S.J., Provincial of the Chicago-Detroit Province, explained that Fr. Adolfo Nicolás, then Superior General of the Society of Jesus confidently affirmed the Catholic and Jesuit identity of John Carroll University. This affirmation is the result of a yearlong Mission Priority Examen process of self-study and priority setting, peer review, and approval by the Provincial. John Carroll was one of only three schools identified to undergo the first round of this process. The NBC/John Carroll University “Meet the Press” Fellowship is awarded annually to a JCU graduating senior who plans to pursue a career in political journalism. The nine-month fellowship was created in 2009 in memory of the Sunday morning program’s host, Tim Russert from JCU’s Class of 1972. The Hal ’81 and Diane Hawk and Carl Hughes ’79 United Nations World Food Programme Fellowship enables JCU students to work for three months at the World Food Programme (WFP). During summer 2016, two students were assigned to the WFP’s U.S. Relations Office in Washington, D.C., and two worked at the WFP’s headquarters in Rome. The fellowships are open to any student of any major, with a preference for graduate students, seniors, and juniors. John Carroll University and the Ohio University Heritage College of Osteopathic Medicine (OU-HCOM) have established a partnership to help talented Ohio high school seniors reserve an assured seat in medical school. This is just one of many opportunities related to JCU’s multi-faceted Pre-Health Professions Program. The PHP Program helps undergraduates make the career choices best suited for their talents and abilities by providing them with information, guidance, and support. The Mike Cleary Program in Sports Studies — a new academic major — helps students gain and develop the knowledge and abilities to succeed in leadership roles in sports administration, coaching, and other careers. In the Computer Science with Healthcare Information Technology major, students learn what it takes to function as a fully capable software developer in any professional environment, but also specifically tailor their skills to the rapidly expanding healthcare IT field. The capstone experience for the major includes interning with healthcare IT professionals. Students can build valuable connections through internships at the Cleveland Clinic and other prestigious healthcare organizations. JCU was selected by the Ohio Board of Regents and the Woodrow Wilson National Fellowship Foundation as one of four sites in Ohio and the only private school for the distinguished Woodrow Wilson Teaching Fellows Program. The program is designed to attract talented and committed individuals with backgrounds in the STEM fields – science, technology, engineering, and mathematics – into teaching in high-need secondary schools. In fall 2017, we welcomed the Class of 2021 with 753 freshmen joining 81 transfer students for a total enrollment of 3,028 undergraduates and 465 graduate students. John Carroll University strives to eliminate family income as a barrier to students considering a John Carroll education. In addition to our highly competitive merit scholarships, John Carroll provides need-based aid and grants to help many families pursue a JCU degree at an affordable price. 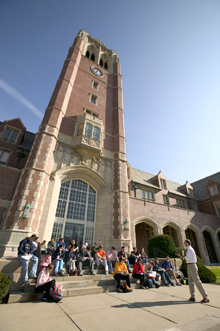 John Carroll University’s impact on Northeast Ohio’s economy exceeded $127.2 million in the year of analysis (FY 2011). This spending by our employees, students, and visitors generated nearly 1,798 jobs and produced more than $67.9 million in household earnings within the region. Our vendors and their employees, in turn, recycle spending within the region for additional goods and services. Fighting Ohio’s “Brain Drain” – More than 58 percent of John Carroll graduates remain in Ohio to become leaders at work and in their communities. 500 companies in Northeast Ohio are owned or operated by Carroll alumni. John Carroll students and grads are in demand; they are engaged in invaluable internships at top accounting firms, Cleveland Clinic, news and media outlets, and Fortune 500 companies headquartered in the region. Crain’s Cleveland Business annually recognizes rising stars in the regional business community. Twenty-eight JCU alumni have been selected as “Forty Under 40” honorees. Our students learn from distinguished faculty who are experts in their respective fields. 97 percent of our 178 full-time faculty hold doctoral degrees or the terminal degree in their field; nine are Fulbright Fellows. Our student/faculty ratio is 14:1. “The Saint John’s Bible” – the first handwritten and hand-illuminated Bible in 500 years — debuted at John Carroll in April 2008. It was the only opportunity to view original pages from this historic manuscript in Ohio, Pennsylvania, and Michigan. The University also has received the first three of seven volumes of the “Wisdom Books,” a stunning full-color reproduction of “The Saint John’s Bible,” for permanent display in the Grasselli Library and Breen Learning Center. The gift was made possible through a generous donation by Target in honor of retired Target Executive Vice President John Pellegrene, a John Carroll Class of 1958 alumnus.